This article was posted on 5th February 2019. Why now? Considering blue has always been associated with classic interiors, luxury and calm; why has it taken us all so long to embrace blue colours in our homes? In 2008 everything crashed, our economy, the housing market and with it, our interior design creativity (don't worry, this tale gets cheerier). White-washed properties were the order of the day due to their saleability. With every interior design decision we made being laced with the question, "Will buyers like that?" and estate agents fueling this blank-canvas fire, to make their jobs a bit easier, we were left with homes devoid of our own personality, quirks and colour. Scandi-style had it's decade in the lime light thanks to its white walls, light woods, simple shapes and parred back style that both renters and buyers gravitated towards. In other words, it was highly inoffensive, beautifully curated but a little bland. From the crevices of white came a trickle of warmth - blush pink emerged as the rose-tinted future. Millennials, blinded by colour for the first time in years, welcomed pale pink into their homes with open arms. Pantone confirmed everyone's suspicions/hopes, with their revelation of Rose Quartz as one of their colours of the year in 2016. A flurry of beautiful pink velvet throws, upholstered beds and blush pink chairs joined our neutral homes and instantly brought vitality and personality. So, with blush pink as our new neutral, we (as in the interiors lovers of the world) set about finding to-die-for 'go-withs'. And boy, did we stumble into a whole world of sumptuous, deep, rich colours - emerald green, dark blue and metallic tones have won the day. While we still adore green, we feel it's surpassed the need for justification. We all hear the words "green velvet throw" and instantly want to see and feel. Blue, on the other hand has been doing a bit of catching up. But with The HOMEWINGS 2018 Interior Trend Report citing consumers favouring midnight blue velvet sofas to any other colour, 2019 looks set to be blue's year. So, here we are in 2019, with homes we plan to stay in, live in, grow old in; gone are the days of buy, do up, sell to make a quick buck. Our interiors are reflecting our passions, desires and loves more than ever, as we're no longer concerned about 'what buyers want' and are focusing on what we want. The results - homes that are all the more vibrant, colourful and welcoming. 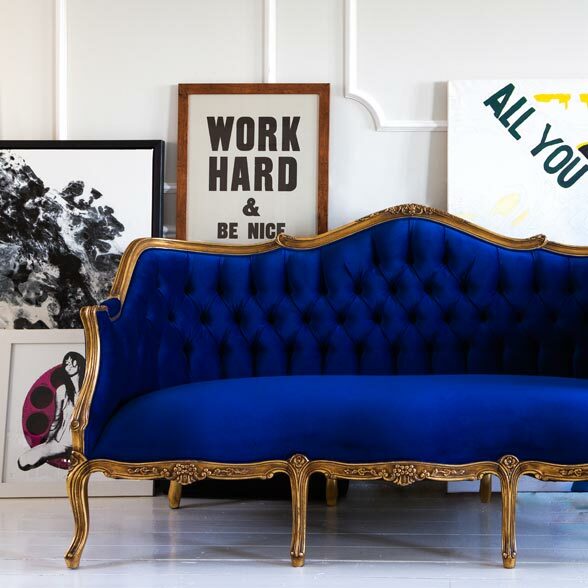 For more blue-spiration and ideas for your home, contact one of our in-house stylists for a chat on why a blue velvet French bed or luxury velvet sofa would be ideal for your home.